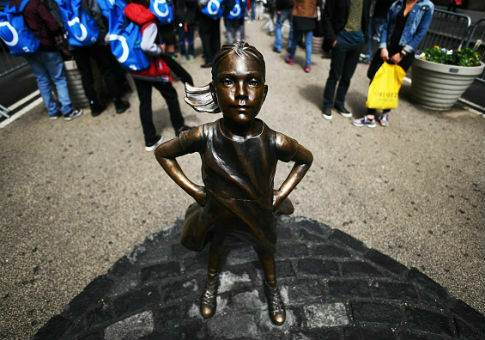 State Street Corp., the multi-trillion dollar asset manager that installed the "Fearless Girl" statue on Wall Street, settled allegations Thursday that it discriminated against female executives. The bank will pay $5 million to over 300 women, according to a disclosed settlement reported by Bloomberg. The settlement follows a Department of Labor audit which uncovered discrepancies between how State Street paid its female executives and their male colleagues. The Department of Labor alleged that women in senior leadership positions at State Street received lower base salaries, bonus pay, and total compensation since at least December 2010. The audit made these findings in 2012, five years before the opening of the Fearless Girl statue in 2017. That statue has become a hit among Democratic politicians, including Sen. Elizabeth Warren (Mass.) and New York City Mayor Bill de Blasio. In March, Rep. Carolyn Maloney (N.Y.) suggested that the statue should ring the opening bell at the New York Stock Exchange. "We have also requested from the iconic New York Stock Exchange to have the Fearless Girl ring the bell at an appropriate time," Maloney told reporters. The New York City Public Advocate also tweeted that the statue should remain part of the city. This entry was posted in Culture and tagged New York City, Wall Street, War on Women. Bookmark the permalink.